This post is sponsored by Samsung Appliances. I love cooking steak at home. It doesn’t take that much time and it’s actually a lot more simple than many people believe. 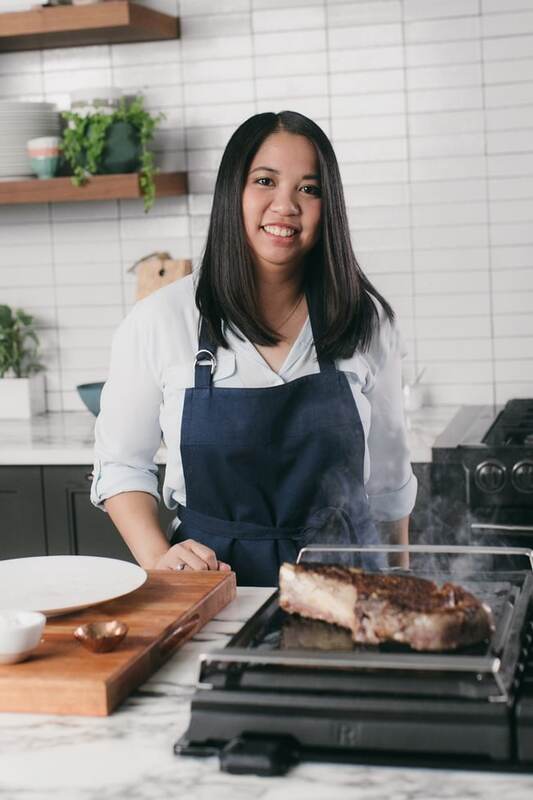 Don’t worry, I have some great tips for you so you’ll make the perfect steak and you’ll always know how to make steak like that! Also, I have a video to share with you! So when you try your hand at it, you won’t be alone. I’ll be there with you, each step of the way! First make the butter. I soften it, then mix in the herbs and sea salt. Then roll in a piece of plastic wrap or parchment paper and refrigerate. 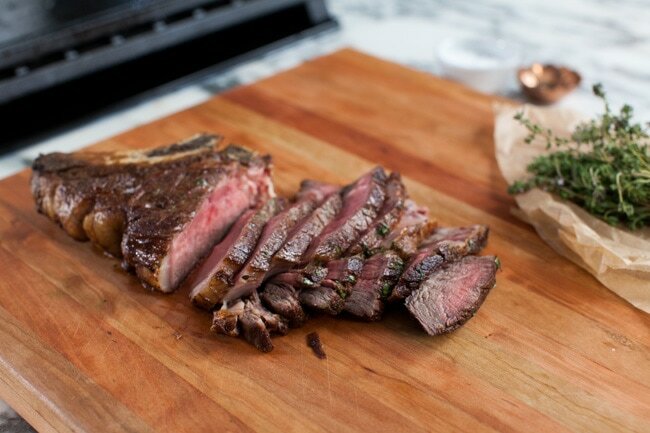 Allow the steak to rest for 30 to 45 minutes on your counter. Preheat the oven to 425 degrees. F.
Prep the steaks by adding salt, pepper and oil on both sides. While you’re searing the steak, you’ll notice some smoking. Just check to make sure you’re not burning the steak (also make sure you’re not poking at the steak or moving it). This is a big mistake so many make. By messing with the steak, you won’t get that perfect sear. I love that you can easily clean the cast iron griddle of the Samsung cooktop. And you can remove it easily to put in the oven! It’s perfect for this recipe! 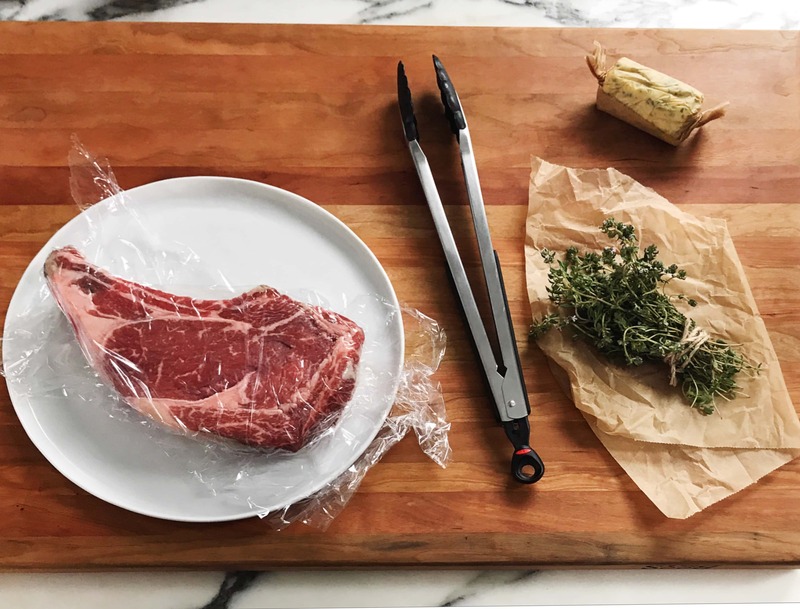 Once the steak’s done searing, you’re going to want to pick up the griddle carefully (with potholders) and place it in the oven to cook further. The Samsung Double Wall Oven lets you get precise heat while it cooks the inside and preserves the sear on the outside! When the steak is completely done, remove the griddle from the oven. 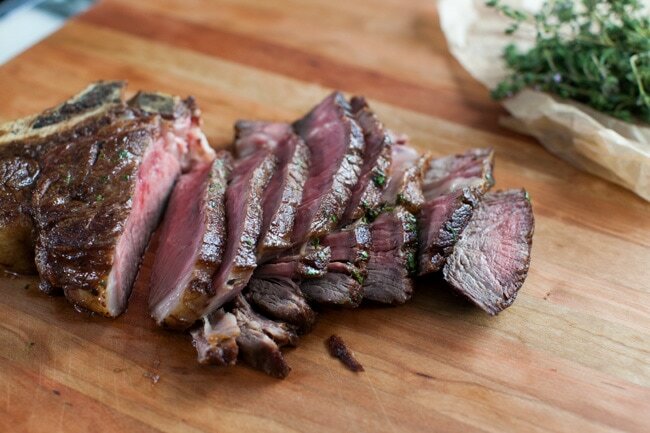 Remove the steak and place it on a clean plate to rest. Allow it to rest for at least 5 minutes before slicing into it. This is so important! For a moist, juicy steak, don’t cut it into it too soon! Here’s that video I mentioned. Watch it to see how to make steak! It’s so easy, right? When you make it for family and friends, you’ll make them feel so special! I can’t wait for you to try it at home! I know you can totally do it! 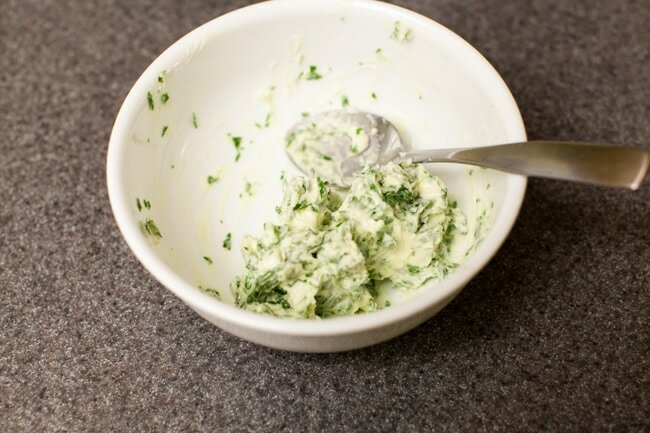 Soften the butter in a microwave or on your kitchen counter. Remove the thyme leaves and chop the parsley. Add to the butter along with sea salt. 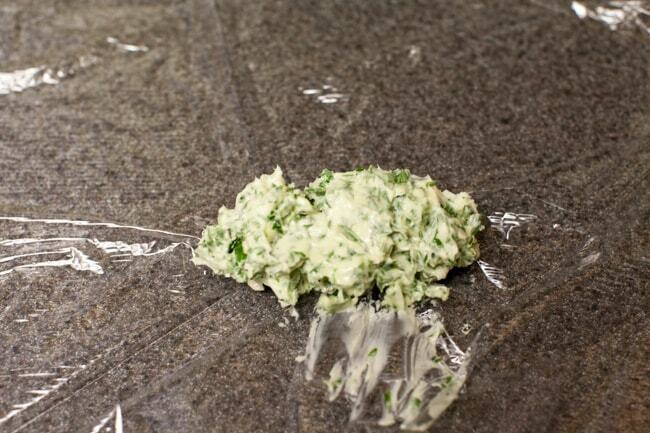 Mix together using a fork, then add to a piece of plastic wrap spread out on your counter. Fold the plastic wrap to cover the butter and mold into a cylinder. Refrigerate for at least 20 to 30 minutes. Heat a seasoned cast iron griddle (or skillet) on medium high for 7 to 8 minutes. After the steaks have rested on the counter, prep the steaks by spreading 1/2 teaspoon of vegetable oil on each side of both steaks. Add sea salt and pepper on each side as well. The griddle should be smoking a little bit. 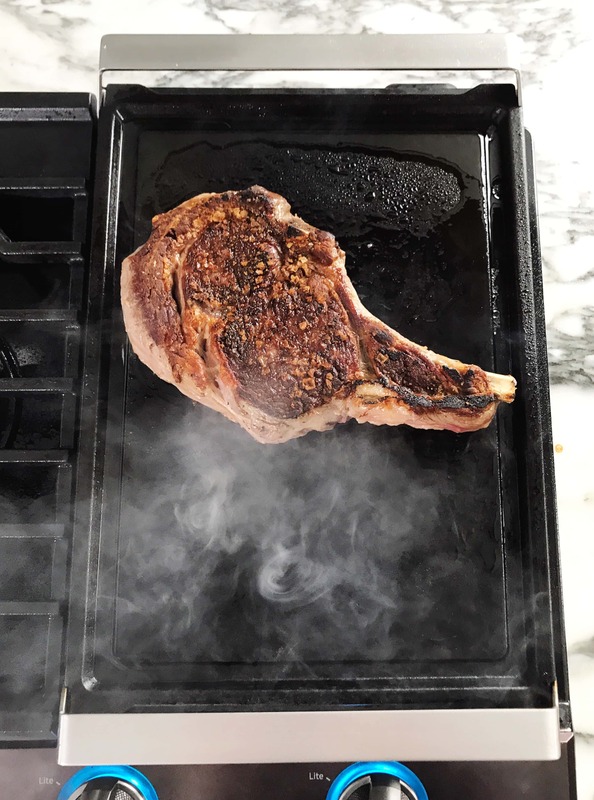 Add steaks to a cast iron griddle and cook on the first side for 3 to 5 minutes (depending on thickness). Don’t move the steaks and don’t squish them or squeeze them. Flip the steaks over and cook on the second side for 1 to 2 minutes (depending on thickness). Slice the compound butter and place one piece on top of each steak. Place the griddle in the oven and allow steaks to roast for 3 to 5 minutes (depending on thickness). 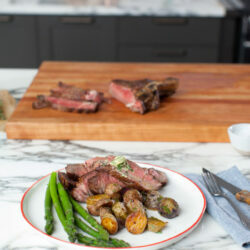 Remove steaks from the griddle and place on a clean plate. Allow the steaks to rest for at least 4 to 5 minutes before cutting into them. Sprinkle more sea salt on top and add more compound butter, if desired. 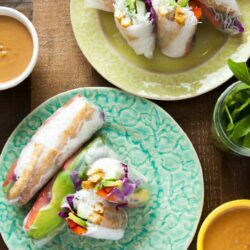 Serve with mashed potatoes or rice and your favorite vegetable. 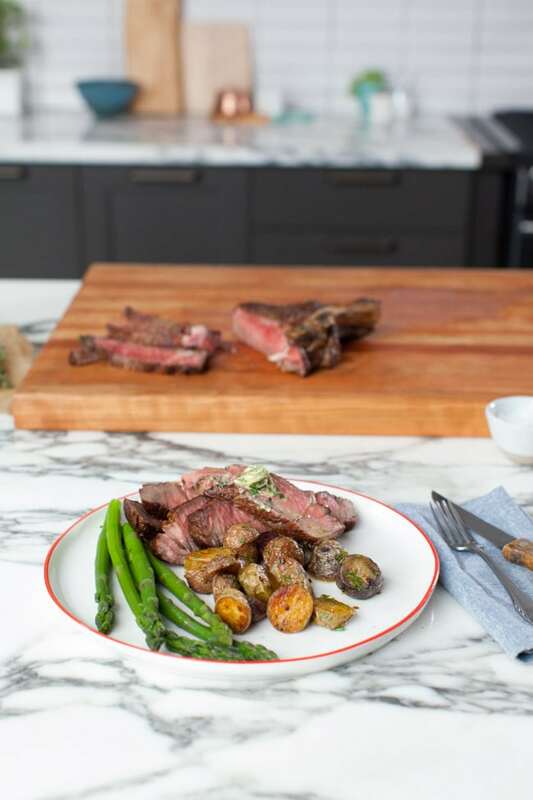 Notes: Steaks should rest on the counter for at 30 to 45 minutes. They will seize up (if they are cold) when you cook them straight from the refrigerator. The key to getting the perfect sear on your steak is to have a really hot skillet. Make sure you let it heat up for a few minutes. It will start to smoke. That’s when you know it’s ready to go. Be careful to not let it smoke too long or you’ll burn the steaks. Disclosure: This post is sponsored by Samsung Appliances. I only work with brands that I love and only share with you my own opinions. Thank you for supporting the brands that make The Little Kitchen possible. Great tips because unless its on a grill, I am not good at making steak. We love steaks at my house and have always seared them in a pan on the stove. Some say to let them rest for 20 min. after cooking, but for us, we would rather eat the steaks when they are hot! I totally needed this! Nobody ever taught me how to do it correctly so I’ve just been winging it. 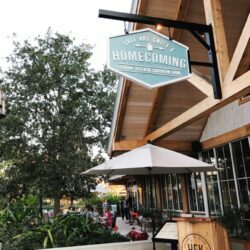 I will be referring back to this post soon for help! 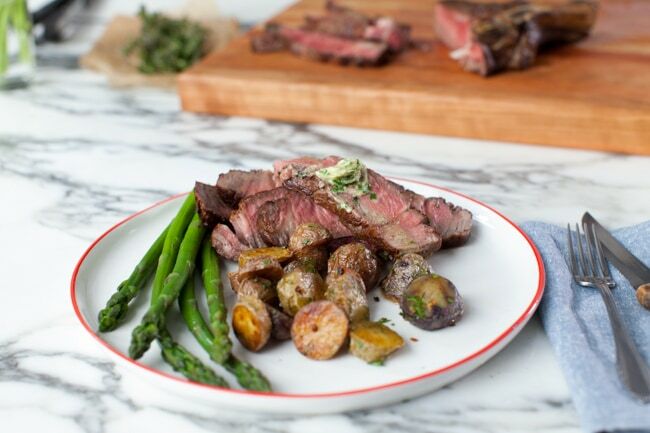 Wow – the addition of that herb butter makes it look amazing! 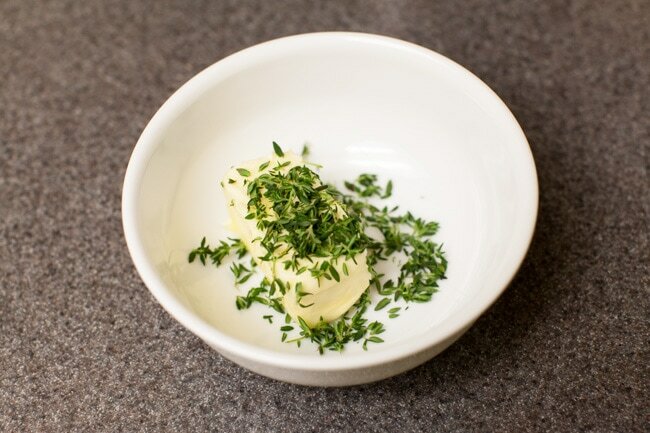 The herb butter looks sooooo good!! Such a smart trick ! I always have such a hard time timing steak perfectly! I am always looking for new recipes. I will try this one out. I appreciate the tips! I didn’t know you should let it rest 30-45 minutes on the counter before cooking. The butter alone looks delicious! Ribeyes are my favorite cut and yours looks great! I am going to try mine next time with your recipe. I love steak. Usually the only time I have it is when we BBQ. Thanks for the tips. Cast iron is the only way to go with steak ! Trying this for dinner tomorrow night – looks yummy. 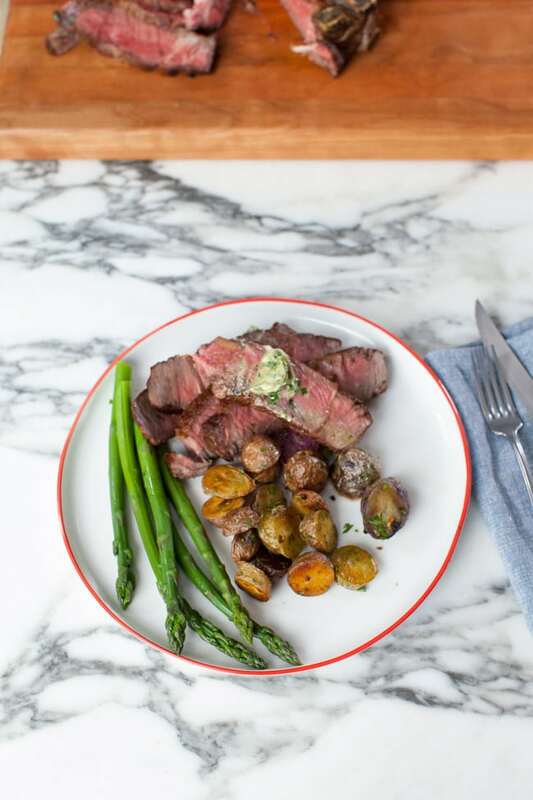 I love the herb butter that goes with this perfectly cooked steak. Sounds delicious. I am drooling just looking at this! That butter!!! This looks easy enough, I will have to give it a try! Thanks for the tutorial. I’m sure mine will never be quite as good as yours, but I keep trying. Oh this looks delicious! We are such steak people and I can’t wait to try it this way.